We are beyond words thrilled to be here, to be with Harry, to be together. We are all savoring each and every single moment. Gwendolyn can't take her eyes off Harry - literally. She is mesmerized by him and his voice. I suppose we all are. We always have been. Anyone who has ever met Harry is. Gwendolyn just keeps waving and smiling and gazing at him. Yesterday morning was the official first meeting and the Vicksburg Post captured all of it -- a wonderful article, photos we will cherish forever, and a video that has us all in tears. Thank you Vicksburg Post for capturing this memory for us. We are trying so hard to hold on to every look, smile, comment -- thank you for making certain that our family will have this memory forever!!! 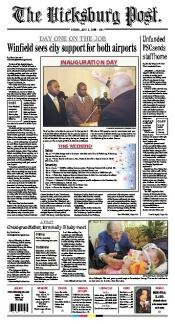 Click here or on the newspaper image below to read the article by Tish Butts and click here or on the video below to watch the video that the Vicksburg Post included as part of the web version of the story.